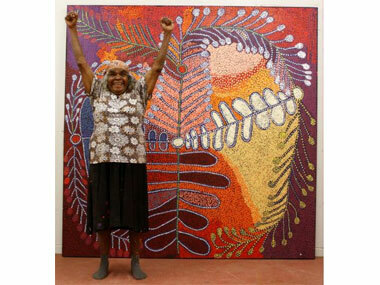 An exultant Ruby Williamson with a vibrant canvas before her recent death. Shorty Jangala Robertson was born around 1925 at Jila (Chilla Well), a large soakage and claypan north west of Yuendumu, the Aboriginal community located 290 kms north-west of Alice Springs in the NT. He lived a nomadic hunter-gatherer lifestyle with his parents, older brother and extended Warlpiri family. They travelled vast distances across desert country, but his childhood memories were dominated by stories associated with the 1929 Coniston Massacre of Aboriginal people and, close to Jila, families were shot at Wantaparri. Shorty Jangala Robertson had virtually no contact with white fellas during his youth but remembered leaving Jila for Mt Theo ‘to hide’ from being shot. His father died at Mt Theo and his mother then moved to Mt Doreen Station, and subsequently the new settlement of Yuendumu. During World War II, the army took people including Shorty from Yuendumu to the northern Warlpiri settlement at Lajamanu. Shorty was separated from his mother; however she came on foot to get him and together they travelled hundreds of miles back to Chilla Well. Drought, shortage of food and medical supplies forced the family back to Yuendumu from time to time. His working life was full of adventure and hard work for different enterprises in Central Australia, but he finally settled at Yuendumu in 1967 after the Aboriginal Citizenship Referendum. Shorty was well into his 70’s when he started painting, but he soon became an active member of Warlukurlangu Artists Aboriginal Association, the art centre located in Yuendumu. Thus Shorty’s paintings are fresh, vigorous and new. His use of colour to paint and interpret his Dreamings of Ngapa (Water), Watiyawarnu (Acacia), Yankirri (Emu) and Pamapardu (Flying Ant) is vital, yet upholding the Warlpiri traditions. His first solo exhibition at Alcaston Gallery in Melbourne in 2003 was met with great acclaim. Since then he has exhibited in Sydney at Coo-ee Art gallery and overseas from South Korea to Texas, via Hong Kong, Bahrain and Germany. 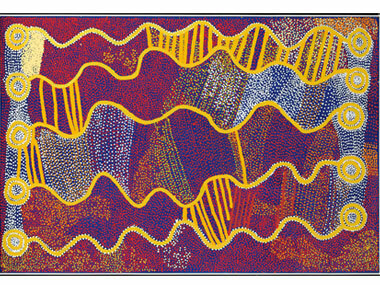 Examples of his artworks can also be seen in the Aboriginal Art Directory Gallery. (Ruby) Kunmanara Williamson was a senior Pitjantjatjara law woman committed to fostering traditional law and culture, story-telling, hunting, punu (wood) carving, dancing and painting. She was born around 1940 in the bush, somewhere out west of Amata. Ruby said her family came to Amata when she was a young girl, most likely around the mid 1950’s. At that time Amata was a cattle station called Musgrave Park, which would eventually be returned to the Pitjantjatjara people in the mid 1960’s. Ruby married a young cattleman who worked at Musgrave Park and nearby stations. 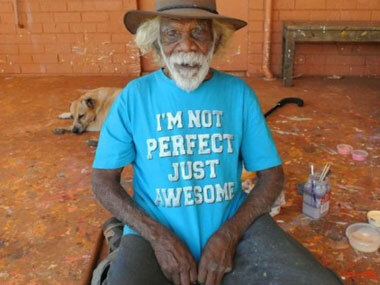 His family are the traditional owners of the country around Amata. Tragically, her husband died in his early forties leaving Ruby to bring up their five children on her own. Ruby has been painting with Tjala Arts since 2000 and received attention and acclaim for her unique, contemporary style and imagery that's distinctly modern in its ideas, perspective and application. All of her works have a quirkiness and freshness that makes it difficult for non-Aboriginal people to pigeonhole her or compare her works with other Aboriginal artists. The National Gallery of Australia purchased a selection of her prints in 2004. Hobart's Art Mob Gallery gave Ruby her first solo show in 2003, and she was contributing to a collaborative painting from Tjala as recently as this September's Desert Mob show in Alice Springs. Her work has appeared at surveys such as the 2009 Telstra Prize in Darwin, the major APY Lands survey, Tjukurpa Pulkatjara at the South Australian Museum in 2010, and 2011's Strong Women Strong Painting Strong Culture tour to Cessnock Regional Art Gallery and the Casula Powerhouse. Overseas, her work has been seen at the Kluge-Ruhe Museum in America and the Red Dot Gallery in Singapore. The late Shorty Jangala Robertson at the Warlukurlangu Arts Centre with one of his four dogs.